Just imagine the situation. You are getting older and are not in the best of health. You live alone with your beloved dog, your constant companion and friend since your husband died some years ago. Sometimes you think he’s the only thing that keeps you sane. But there’s one problem that’s destroying your peace of mind. That keeps you awake at night. You’re finding it harder and harder to get about. The doctor is suggesting residential care but you can’t bear to be parted from your pet. And, you have to face it, even should you remain at home, what will happen when you die? Who will look after him? How will he cope? This is the agonising problem that faces many elderly people. Those who become terminally ill confront the same difficulty, have similar fears and worries. This is where the Cinnamon Trust comes in. I came across it almost by chance when I was researching something else on the net. It’s the only specialist national charity with the sole aim of helping older people, and those who are terminally ill, to ensure that their pets are well looked after when they can no longer care for them. I’m amazed to discover that in the UK at least, it’s the only charity working quietly in this crucially important but almost invisible area. The trust was founded nearly thirty years ago by Mrs Avril Jarvis, and named after her much-loved corgi – Cinnamon. It’s stated aim is ‘to respect and preserve the treasured relationship between owners and their pets.’ It works in partnership with owners, solving any difficulties that arise. Avril Jarvis says she has known many elderly people who have, quite literally, lost the will to live when their pets have died, but have been too worried about what might happen after their own deaths to acquire new animals. With this in mind, the Trust enables owners to hand their pets over to the Trust before they die, or on their death, so that they have the comfort of knowing not only that their companion will be well cared for but also who will be doing the caring. Younger animals are fostered long-term with financial help from the charity or matched with distressed owners whose pets have died. Older ones live out their days comfortably in one of the trust’s two unique sanctuaries in Devon and Cornwall. What makes these sanctuaries so special is that they replicate, as far as is possible, a proper home. Instead of kennels or cages there are sofas and armchairs, rugs and cushions. Even TVs. Everything these pets would have been used to. The Trust does more than provide sanctuary and match pets with new owners. An army of volunteers, the length and breadth of Britain, come to the rescue in all sorts of situations. From short term fostering when someone is in hospital to walking a dog for a housebound couple, to driving a pet to the vet or shopping for supplies. If I ever win the lottery, there will be a shed load of money coming their way. 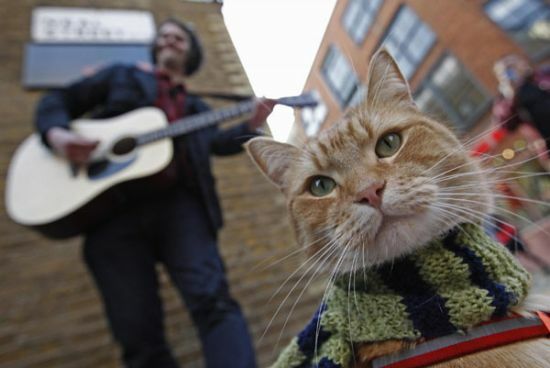 The first time I met them, three or four years ago, my attention was caught by this tall man striding along the raised pavement on Upper Street, a ginger cat trotting along at his heels. That was my first sight of James and Bob. I followed them and had a chat with James. I was a little concerned – Bob was so tiny among all those feet rushing headlong along the pavements. James reassured me. And of course there was absolutely no need to fear – James would never allow any harm to come to Bob. 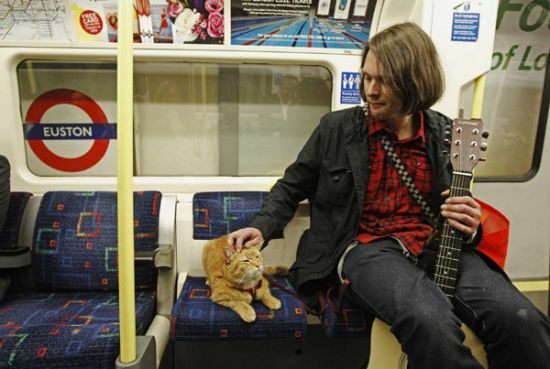 I’d see them from time to time, in the following years, maybe on the bus, sometimes in the street, James playing his guitar, Bob sitting quietly at his feet. Or draped around James’ neck. There was nearly always a small knot of people clustered round them. I’d stop for a quick word and to give Bob a stroke. Seeing them always made my day. A while ago James mentioned something about a book. I remember thinking that I hoped he would get something out of it, that it would really make a difference to him and of course to Bob too. I’m delighted to say that the book is out and it really is going to make a difference. When I met them on the 38 bus, a few weeks ago, James handed me a flyer advertising his book signing saying he hoped I’d come along. Try to keep me away! As soon as I got home I put it in my calendar and last Tuesday, in spite of a wonky foot, I took myself off to Waterstones on Islington Green. I got there early but the press had already set up outside the store and I could see people being interviewed. I went in, bought the book and hung around chatting to others as we waited. More and more people arrived; before long the queue was out the door. A ripple of excitement. Bob and James appeared on the stairs and made their way down. Before the signing could get under way there was a paws – sorry – for photographs. 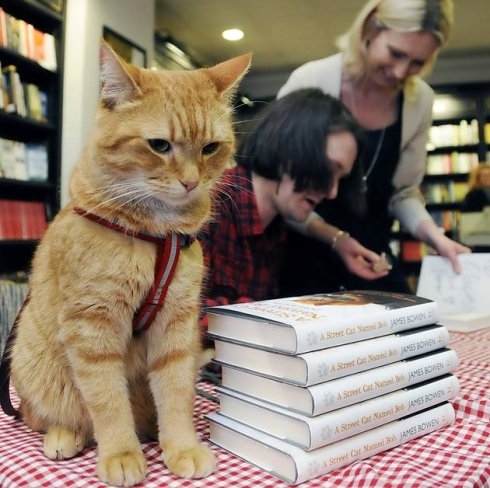 Bob took it all in his stride, sitting on James’ shoulder, posing beside a pile of books, standing on his hind legs to nibble a treat. James signed book after book, writing individual and personal messages. Bob, with a little help, added a paw print. Half way through the evening the book was sold out, but there was a promise that they’d be back to sign the many other copies on order. I was one of the lucky ones who got my book signed. I only had time for a quick read during the week but this weekend I sat down and read it from cover to cover. It’s a great story and very moving. It really is true what James says that they rescued each other. I really hope it will help a lot of people be more understanding. James, a street musician, writes honestly about the life he led when he was a recovering heroin addict, about the battles he’s had to fight, about the loneliness of life on the streets and about how meeting Bob helped him turn his life around. I have nothing but admiration for him – it takes guts to beat an addiction. It takes a special sort of bravery and determination to pull yourself back up when you are alone and down. When one dreary day follows another, when it’s hard to see any future. If he hadn’t had such a big heart, if he hadn’t taken pity on the scruffy, sick street cat things might have been very different. He wasn’t looking for any reward when he took Bob in, he couldn’t possibly have known what the future would bring. Now, because of his own act of kindness, James has hope and a new life. 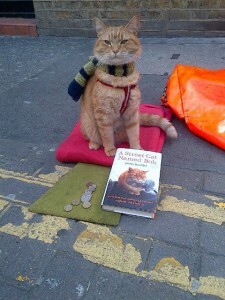 Man and cat had already rescued each other when agent Mary Pachnos approached them to suggest a book. It’s a lovely book, heartwarming, and they’ve got a great agent who will look after them and I wish them a very happy and contented future together, whatever they’d like it to be. Post Script. I had talked about the book signing on twitter, and I’m sure many others had too. What I hadn’t expected was the reaction the following day – people were twittering from the USA, the Ukraine, Brazil – everywhere. The story was covered globally including by CBS news and China Today. I’ve never seen anything literally go viral before – it was amazing. Well done to everyone who helped in any way.